Although Singapore is one the richest countries in Asia, there are many poor people in its midst who cannot afford the soaring food price and the high cost of living. Many of the needy are the silent workforce – foreign workers. Their salary are so low that Singaporeans would not take these jobs. Help is available for the needy. Yes, there is such a thing as free lunch in Singapore. Some religious associations and welfare groups provide free meals. The bills are sponsored by members of these groups and business people. The Kim Yan Road temple serves free vegetarian breakfast, lunch and dinner from 7am to 7pm. All are welcome regardless of their race or religion. In the queue one can find all sorts of people, from the homeless, unemployed, foreign students, foreign construction workers and of course some freeloaders who work nearby. The temple in Jalan Bukit Merah provides free vegetarian Indian lunches every day. This Catholic church at the end of Upper Serangoon Road provides free breakfast and lunch every day. The Lutheran King of Glory Church in Norris Road, serves free meals every Sunday to Indian workers dring its Taml service. This Buddhist temple at South Bridge Road provides free meal from 12.30pm to 6.30pm every day. invites foreign workes to its Sunday breakfast buffet. They have meal centres in Toa Payoh (Blk 31 #01-663 Lor 5), Telok Blangah (Blk 3, #01-504, Telok Blangah Crescent) and MacPherson (Blk 90, #01-103, Pipit Road). The Hindu religious group at No 9, Lor 29, Geylang serves free vegetarian food from 11am to 10 pm daily. The Centre at Toa Payoh, Lor 7 Blk 5 #01-131 serves free breakfast, lunch and afternoon tea for senior citizens. If you are a needy resident living in Tanglin-Cairnhill area, you can apply for help at the Tanjong Pagar GRC. The GRC, under the free Hawker meal Program provides $36 worth of meal vouchers every month to needy recipients for a year. You can exchange the $3 voucher for a free meal at selected food staff at some of the coffee shops in Bukit Merah View and Henderson Road. This restaurant at Cuff Road provides free breakfast (from 7am to 9am) and dinner on weekdays only and lunch on Sundays. This is for stranded Indian workers in Singapore whose beds are the concrete walkways along Cuff Road. These distressed migrants are abandoned by their employees after their work injury or they are duped by the agents. To qualify for the free food, participants are asked to show a Special Pass (a govt-issued document, which means they do not have a work permit) or evidence that they are injured / have a case pending (a letter from a doctor/lawyer plus a work permit). It is funded by the Transient Workers Count Too (TWC2) together with One Singapore. A Catholic humanitarian group called the Archdiocesan Commission for the Pastoral Care of Migrants and Itinerant People or ACMI, feeds migrant workers three times a week at its premise in No 2, Highland Road. The Migrant Workers Centre in Rangoon road provides free lunches once a month in parntership wth neigbouring restaurants. The center is a joint effort betweeen the NUTC and the Singapore national Employers Federation. Their meals-on-wheels for Elderly distributes free lunches to needy, frail and homebound senior citizens in Banda Street, Bukit Merah View, Cantonment Road, Holland Road, Lengkok Bahru, and Mei Ling Street. provides free dinner for children from Low-income families who are schooling in Zhangde Primary School, New Town Primary School, Queenstown Primary School, Gan Eng Seng Primary School and Beyong Social Services. For more information on the meals-on-wheels program, please contact Ms Celest Ling at 6223 1227. 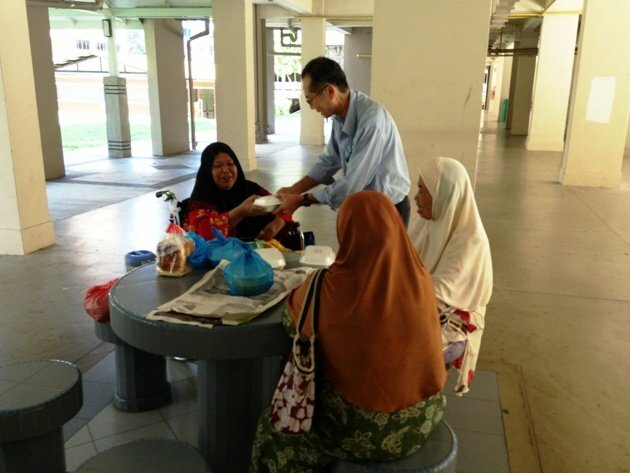 The Willing Hearts, a secular group, distributes free food in 10 areas, among them Ang o Kio, Bukit merah and Hougang. Call 9690-2086 for more information. In these times of needs, there is no shortage of compassion from the people of Singapore. Nobody in Singapore needs to go to bed hungry. Thankfully, nobody starves to death in Singapore. Woon tien and jenniffer from ex post musuem also distribute food every week once to the poor residents near jln besar flat …….